Texas may be a red state, but for at least the weekend, it served the role of a battleground for two party leaders determined to put their spin on President Donald Trump's agenda in the lead-up to the midterm elections. DALLAS — Texas may be a red state, but for at least the weekend, it served the role of a battleground for two party leaders determined to put their spin on President Donald Trump's agenda in the lead-up to the midterm elections. The state played host Friday and Saturday to Vice President Mike Pence and U.S. House Minority Leader Nancy Pelosi, D-Calif., providing a split-screen battle as the two worked to rally their party faithful for victory in November. Republicans are seeking to protect their congressional majorities against historical headwinds and surging Democratic enthusiasm, even in GOP-dominated Texas. In a speech Saturday night to the Dallas County GOP, Pence acknowledged that conventional wisdom says the party in power tends to have a difficult time in its first midterm elections. "At least that’s the conventional wisdom. But I think you know what President Trump thinks of conventional wisdom," Pence said, alluding to Trump’s upset victory in the presidential race two years ago. "We threw out the playbook in 2016, and we’re going to throw it out in 2018." Visiting Dallas on Saturday, Pence offered a triumphant midterm message from the Trump administration — "Promises made, promises kept" — and exhaustively touted the tax overhaul that Trump signed into law last year. 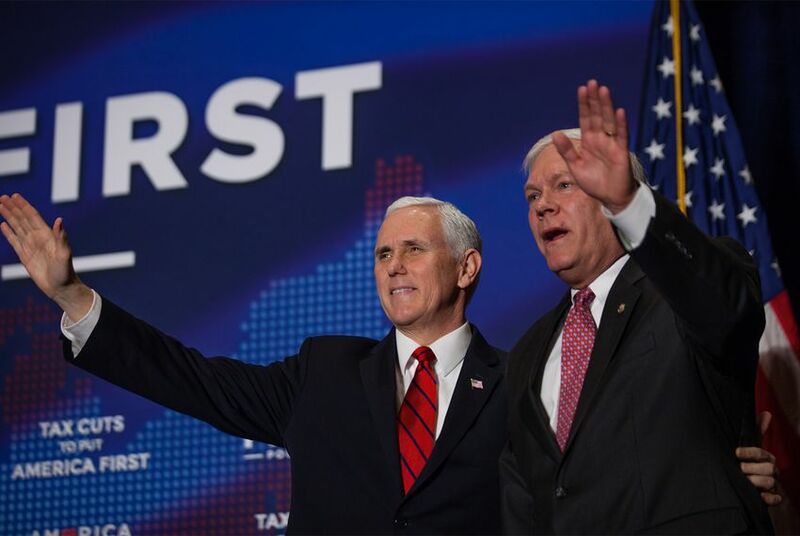 In the morning, he spoke at an event for America First Policies — a pro-Trump advocacy group — that was exclusively about selling the benefits of the bill, which Pence said has already spurred tens of thousands of "Trump bonuses" in Texas alone. The night before, Pelosi was painting a starkly different picture of Trump’s first year while headlining Harris County Democrats’ Johnson, Rayburn, Richards Dinner. She spoke of Republicans under Trump being a "party at war with the fundamental concept of government" and warned of a "dark cloud that hangs over the Capitol." "It hangs over the Capitol in the form of the tax scam that the Republicans have pushed forth and that is the basis for the Trump budget," Pelosi said, characterizing the bill as a $1.5 trillion giveaway to corporate America — and a precursor to the steep cuts to America’s social-safety net in Trump’s budget plan, which was released Monday. "Is that a statement of your values?" Pelosi asked Harris County Democrats. "I don’t think so." Pelosi continued to hammer the tax law and Trump budget at another event in Houston the next morning, which was billed as a "#GOPTaxScam teach-in." She is scheduled to join U.S. Rep. Joaquin Castro in his home city of San Antonio on Monday for a discussion of the law and its "harmful impacts" on families across the country. Pelosi herself was a topic in Dallas. Before Pence spoke, she came up on a panel discussion between Lt. Gov. Dan Patrick and U.S. Rep. Jeb Hensarling, who both ridiculed her for her comments after the bill's passage that dismissed employee bonuses as "crumbs" compared to the bill's economic benefits for corporations. "The idea that she calls it crumbs shows how out of touch with the American worker, the American family, she is," Patrick said, suggesting the attitude only works in Republicans' favor. "I hope she keeps saying that. ... Keep talking, Nancy!" Pence piled on his speech to Dallas County Republicans, riffing that he is from the "Jos. A Bank wing of the White House" and that when his children were younger, he had a different term for $1,000: "Christmas." He put Pelosi’s comment in the context of the midterms, criticizing her as out of touch while referring to her as “the woman who wants to be the speaker of the House again." Pence began his swing through Texas on Friday in San Antonio, where he appeared at fundraiser for Trump Victory, a group that benefits the president's re-election campaign and the Republican National Committee. Pence then headed to McAllen, where he toured the Mexican border with U.S. Sen. Ted Cruz of Texas and U.S. Homeland Security Secretary Kirstjen Nielsen. Recalling the McAllen trip while speaking Saturday morning in Dallas, Pence touted a drop in illegal crossings since Trump took office but insisted there is still more work to do to increase border security — including making good on the president's signature campaign promise, which remains in limbo in Congress. "Make no mistake about it — we're going to build that wall," Pence said, bringing the friendly crowd to its feet amid long applause. In Houston, Pelosi kept the immigration discussion focused on "Dreamers," young people brought into the country illegally years ago as children. The two parties in Congress have so far been unable to reach a compromise that provides relief for Dreamers — a Democratic priority — while beefing up border security, a GOP goal. "We will never stop until they are protected," said Pelosi, whose recent eight-hour speech about Dreamers on the House floor was repeatedly toasted throughout Friday night. "To do anything less for the Dreamers is to diminish who we are as a country. This fight will continue." Pelosi was not the only VIP who was heard at the Harris County Democratic Party dinner. Hillary Clinton, the 2016 presidential nominee, called in to the event via a phone held to the microphone by U.S. Rep. Sheila Jackson Lee of Houston, thanking "everyone working to turn Texas blue." "I have a good feeling that this could be the year," Clinton said. "Go get them, Harris County!" Harris County, which includes Houston and is the most populous county in the state, went solidly for Clinton in the 2016 race after delivering much closer margins in previous presidential elections. The theme of the Johnson, Rayburn, Richards Dinner was “It All Starts Here” — an acknowledgment of the county’s essential role in any future Democratic takeover of the state. The effort to turn Texas blue did not go unacknowledged at the Dallas County GOP dinner. More than once throughout his remarks, Pence made a re-election pitch for Cruz, who faces a well-funded challenge from U.S. Rep. Beto O'Rourke, D-El Paso. "He’s the pride of Texas, and he’s one of the most clarion, unapologetic and courageous conservative voices in the United States of America," Pence said of Cruz, Trump’s former bitter rival in the 2016 primaries. "President Trump and I want you to make sure to send Sen. Ted Cruz back to the United States Senate." "He’s worked shoulder-to-shoulder with this president every step of the way," Pence added after a flood of applause and standing ovations subsided. Cruz, speaking later in the night, continued to press his case — amplified in recent weeks — that Republicans should not underestimate the extent of Democrats’ opposition to Trump and how it could drive them to the polls in November. He referred to Dallas County, where Republicans are looking to stave off further Democratic gains this year, as a "battlefield." "The left is showing up in massive numbers," Cruz said. "They hate the president, and we’ve got to make sure Texans stand up and keep Texas red." More locally, Democrats are newly targeting U.S. Rep. Pete Sessions of Dallas after his 32nd District swung for Clinton in 2016. Sessions did not shy away from Pence’s spotlight Saturday, introducing him at the America First Policies event and getting effusive praise in return from the vice president, who fondly recalled their time serving together in the House. Sessions, a former chairman of the National Republican Congressional Committee, and other members of the Texas delegation were expected to join Pence for a fundraiser Saturday afternoon for efforts to protect the House GOP majority in November.